The context of 1920s fashion history was about bringing style into the modern world with simple dresses, short hairstyles, and close fitted hats. The rapid changes in fashion reflect the rapid changes in society. The end of World War One, the growing economy, the rise of the middle class, and the urbanization of America were signals that the world was changing. People wanted to change with the times. . . Changing with the times is often first seen in what people wear. Women wanted the ability to express themselves. The women's suffrage movement and prohibition marked the political power of united groups of people. With these social changes coming so quickly, the 1920s is seen as "THE decade of change." It's said the "Jazz Age" started in 1918 when a beautiful young socialite caught the wandering eye of a young Army Lieutenant. The Jazz Age ushered in the famous fashion and music that has come to symbolize the entire era in history. 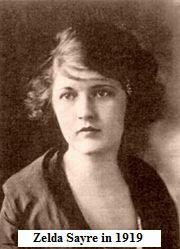 That young Lieutenant was F. Scott Fitzgerald and the young woman's name was Zelda Sayre. The couple would go on to define the "flapper" generation with their lifestyle, fashion and attitudes. Scott would be the "Flapper King" and Zelda was his "Queen". It's impossible to name another period in fashion history that had the social impact 1920s fashion had on society. From the flapper dresses to the cloche hats, the fashions define the era. The straight "dropped waist" 1920's dresses with the rising hemlines, bold colors, and luxurious fabrics signaled a major shift in the way people looked at the role of fashion in society. Not only did 1920s fashions look totally different the young women wearing them acted "different." No longer was it uncommon for a young "lady" to go out drinking and "go all the way" with a boy in the back seat of a parked car, or to go out all dancing all night at some jazz filled speakeasy. Nor was it uncommon for her to assert herself, speak her mind, vote, or work at a job. Dangerous reputations were the calling card of the popular young girls of the 1920's. Making love it's said was "part of the social structure," as were cigarettes, whiskey, make-up, short dresses, and bobbed-hair. The 1920's woman is renown for her spirited attitude and her love of music and fashion. 1920s Fashion and music go together like peas and carrots. In the Twenties, the new sounds of jazz reflected the new styles in fashion. Skirts moved with the rhythm of society, bobbed hair was covered in mystery by the close-fitted cloche hat, and inexpensive designer jewelry adorned the young women who became the icons of the era. Fashion was at a turning point: it was becoming popular with "regular" people. For too long haute couture (high fashion) could only be found on the ladies of the upper crust, walking around with their noses in the air. The simple and relatively inexpensive 1920's dresses leveled the playing field for women who wanted to look their best and make their own way in society, despite the fact they had little money. In 1920 it was more likely for a young woman to leave her family's country home for the city in search of fulfilling her dreams of fun and excitement. Discovering a way to make a living, and perhaps if luck was on her side, to become a celebrity. These were, after all, the "New Women." The world was full of choices for the 20's woman. And one of the easiest ways for a woman to assert her choices in society was to choose what she wanted to wear. The old Victorian fashions would not work in this new world. While Victorian fashions emphasized opulence and "largeness", 1920s fashions stressed slenderness, mobility, and grace. Fashion had been stripped to its core at the urging of a receptive consumer.